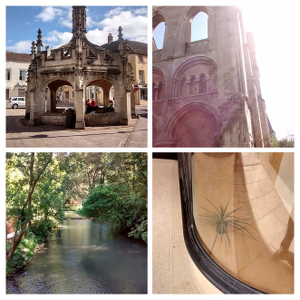 We went on holiday to stomp around our old stomping grounds near Bristol and Bath. And we took advantage of being there to visit a few places that we'd never been before, such as Malmesbury. "You ought to put me in a poem." So I noted them down. However, when I reviewed the list later, the sequence of random observations didn't seem to really add up to a poem about Malmesbury. So the list languished in my backlog until this morning, when needing a poem for my poem-a-day, I dug it out, blew the dust off, and started again. It is not, however, about the excellent free WiFi they had in the 7th century abbey. That only appears here in these notes. toast gently in late summer sun. in the booklet and beneath our feet. while two blokes fix the roof. seating is reserved for only jackdaws. there's paintings and a "Freedom" collage. "theory of café catering" with the waitress. to fix the lad's spectacles. we're on the other carriageway now.